The therapeutic effect of Noni fruit powder is very effective but less known | HANG XANH INTERNATIONAL Co., Ltd.
How is the dough prepared? The dough is made by traditional Chinese medicine doctors from noni fruit to make it easier to use than sharpen fruit juice to drink. With the dough, the use of treatment is much easier. Just make a spoonful of dough with a small glass of water dissolved, the patient can drink like water every day. Noni fruit powder also works sedative, easy to sleep, beautify the skin. Because of this great use, it is very heartfelt for you. Using non-dough fruit powder will keep you from eating, helping you lose weight effectively. Regular use of noni fruit powder helps to remove heat, detoxify the liver, regulate contraction and secretion of fluid in the stomach. The sour taste of the noni fruit will increase the smooth muscle contraction in the intestine, thereby helping to push the stool out more smoothly. When constipated, instead of taking laxatives, you can use noni powder noni powder, it is very easy to go outside because of the contractions of the intestine. According to studies by Dr. Heinkch, by Annie Hizazumi (American University of Hawaii), along with studies from France and Japan, the ingredients in Noni fruit powder are able to inhibit Ras's cancer cells (a cancer cell type) and has a limited and diminishing effect on tumors. 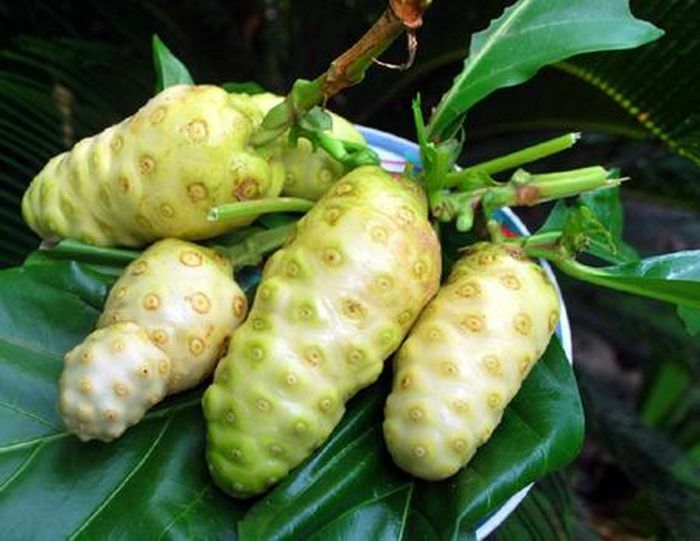 Noni fruit has anti-oxidant and increased glucose tolerance, and provides DAA acid to reduce blood glucose. Through these mechanisms, leading to the prevention of diabetes. Regular use of cysts can help treat pain in the body such as back pain, neck pain, muscle aches, nerves and pain such as stress, migraine. Helps fight allergies, prevents depression and mental disorders in menopausal women. Besides, it also helps regulate menstrual disorders. In noni fruit powder, people also discovered Polysaccharides to help improve the body's immunity. In addition, this remedy also provides 40 times more prosertonin than pineapple. Stimulating the production of T cells - this cell plays a key role in fighting disease. Helps phagocytosis and lymphatic cells to function strongly Along with that can attack many other bacteria in the body. After being absorbed in the intestinal pulp, it is converted into Xeronine, which helps maintain the normal functioning of the cells in the body. At the same time they also prevent the development of disease, protect health. The pharmacological effects of caffeine may include mild and long-term laxatives, mild diuresis. Noni fruit works to inhibit some fungal pathogens and influenza viruses. Besides, it is also effective in relieving muscle and joint diseases such as arthritis, wrist bone pain syndrome. At the same time, it helps reduce pain and reduce swelling of the wound with symptoms such as bruises, stretches of skin and burns. Effective in preventing the development of ulcers and rashes. Some of the uses of dough can be effectively treated: for low back pain, rheumatism, osteoarthritis, high blood pressure, prolonged hypotension, work stress relief, Helps calm the nerves for the body, treat digestive disorders, beautify skin for women, prevent anti-aging, transform breast cancer cells of women. Noni flour is currently sold a lot on the market but according to many customers' evaluation, dough is sold at Nguyen Luong Herbal which is chosen by many people because of its quality and reasonable price.